As a mom, I try hard to make spiritual experiences as tangible as possible for my children. I do not want them to think of God as a far-away being but rather Someone who is near, next to, within and all around. I know that it is not always necessary to feel close to God in order to be close to God, but having some tangible experiences can help our overall relationship with the Lord. I think that’s one reason God gave us our five senses. To truly be able to experience Him and the gifts He gives us. 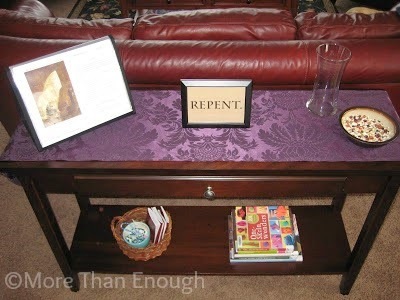 With Lent only a week away, I started wondering how I could make it more hands-on for my children. What books will we read? What sacrifices will we make? How can we measure our Lenten goals? How can we make sure our Lent begins with love? My thoughts turned to those five senses, and I began brainstorming ways my family can truly experience Lent through sight, sound, taste, smell and touch. My hope is that Lent will not be some dreadful season of not eating our favorite foods but rather a time that helps us recall Jesus, how much He loves us, and how we can be closer to Him. Create a focal point. 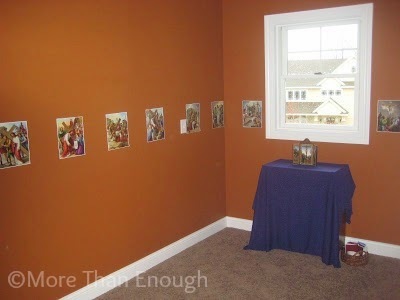 Over the years, I have found it helpful to create a prayerful corner in our home that changes with the liturgical seasons. It is so easy to do this during Advent and Christmas with our Nativity scene as well as during May with a Mary altar. For Lent, our space is simple, yet it sets the tone for the season. Post a calendar. 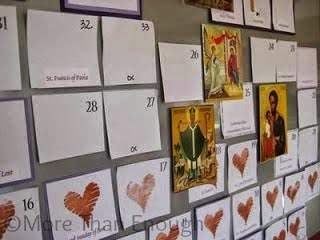 Create or print out a calendar for children to mark the days of Lent. Or make a Lenten paper chain, similar to the ones used during Advent. Something that keeps track of the days of Lent can help the season not feel so endless for children (and adults alike). Light a candle. During family prayer times, light a candle. The flame draws children into the special quiet time for Jesus. When praying the stations of the cross, light 14 votive candles, and blow one out after each station. During the stations, it will get darker and darker. At the end, talk about what the darkness represents in relationship to Jesus’ death. Turn it off. In this day and age, we are bombarded with noise wherever we go. The ping of a text message, the buzz on the radio, the TV in the background. Make a conscience effort to enter into silence, so that you can hear the sound of God’s voice this Lent. Perhaps that means not listening to the radio in the car or limiting media in some way. Do not be afraid of the silence; God often speaks to us with a whisper! Tune in. Listening to sacred music, like Gregorian chant or Latin hymns, can be a peaceful part of Lent. 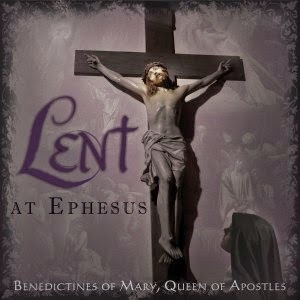 Play a beautiful CD such as Lent at Ephesus by the Benedictines of Mary, Queen of the Apostles during breakfast or homework time. It can also be a great way to unwind at the end of the day, especially if you are sacrificing TV this Lent. Listen up. Speaking of sacrificing TV, if that is your family’s plan for Lent, perhaps it makes sense to invest in some faith-based audio CDs for the gang to listen to. These CDs provide hours of entertainment to children and teaches them valuable insights into the Catholic faith, too. Some of my family’s favorites include Cat Chat and Glory Stories. Go meatless. As you know, on Ash Wednesday and all Fridays during Lent, the Church asks us to abstain from meat. It can be challenging to know what to cook for a family when you are used to eating meat as the main portion of your meal. Now is the perfect time to try out some new meatless recipes. 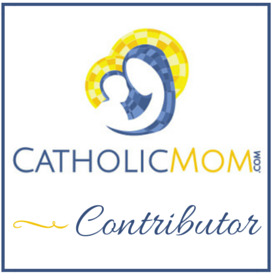 CatholicMom.com has a Meatless Fridays feature with numerous recipes. Pick out a handful to try during Lent! Practice solidarity. One small way to show true compassion for the poor around the world is to participate in Operation Rice Bowl or another similar program. (I am aware of the controversy surrounding Catholic Relief Services, and it is something I am trying to understand better.) My main point is that by donating money to a global or local charity or by serving at a soup kitchen, we can support the well-being of the poor and grow in solidarity with our brothers and sisters in Christ. Sacrifice a favorite food. This is a common Lenten practice, but it can be very challenging, because we are creatures of habit. I have found that when we decide to sacrifice a favorite food as a family, it is especially meaningful. In addition, making a sacrifice together allows the family to encourage one another when challenges and temptations arise. Lastly, it can help to designate a specific intention for our sacrifice. Or if you have more than one person or purpose to pray for, consider having a different intention for each day of the week and add them to your Lenten calendar (above). Use incense. Every Sunday night, my husband lights a charcoal and selects some incense to use during our family rosary. We have a simple incense burner that is easy to use at home. The incense marks the prayer time as special and set apart from everything else we do throughout the week. I love the aroma that permeates the entire house, and I get wrapped up in meditating on the rising smoke symbolizing our prayers rising up to the Lord (Psalm 141:2). Clean the house. Lent is a wonderful time to do some heavy-duty spring cleaning. It is an outward sign of the interior cleansing the Lord is doing in our hearts during this penitential season, and it also is a great way to incorporate almsgiving by making donations of our gently-used belongings to local charities. Plus, a clean house smells so good! It will definitely give us a sense of hopeful anticipation for Easter! Read a book. I usually select a spiritual book to read during Lent. I find it so helpful in my prayer and my focus during this special time of the year. I like reading a “real” book with a cover and paper pages that I can feel in my hands and highlight when needed. I am very much considering reading 40 Days, 40 Ways: A New Look at Lent by Marcellino D’Ambrosio, Ph.D. 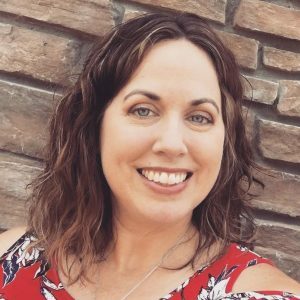 Here is a book list by Jean Heimann that lists some great suggestions, too! Put books in a basket. Books are wonderful tools for our children to learn about our Catholic faith. With the different liturgical seasons and feasts, often I rotate our books to highlight certain themes and saints. Here is a list of some of our favorite Lenten books. Do you have any to add? Oh! And I can’t forget Welcome Risen Jesus by Sarah Reinhard, which is a great daily devotional for families, and Amon’s Adventure, which makes a wonderful family read aloud. Cling to beads. A beautiful practice to adopt during Lent is praying the Rosary and/or the Chaplet of Diving Mercy on a more regular basis. Begin with a decade a day to pray one Rosary per week. Or if you already pray the Rosary as a family, why not add a day during Lent? 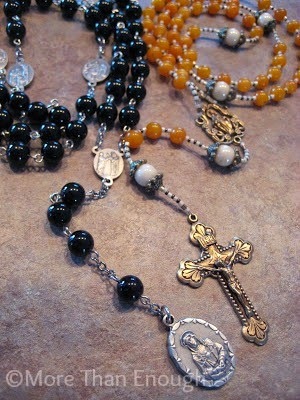 Or add the Chaplet in the afternoons? Also, Our Lady of Sorrows Rosary (chaplet) is a perfect devotion for Lent, because it focuses on the sorrows that Our Blessed Mother endured. Praying with our Rosary beads allows us to tangibly keep track of our prayers. They give us a sense of security in knowing God hears our prayers. I have heard that when we are holding our Rosary beads it is like holding Our Blessed Mother’s hand while we pray! What a beautiful idea to contemplate and share with our children! The purpose of this post is not to make you think that you have to do ALL of these suggestions! On the contrary, this list is meant to get you thinking about what will work for your family. I am a big advocate for keeping Lent as simple as possible. What I hope to convey is that Lent does not have to be an abstract idea but rather something tangible that we can truly experience in our everyday lives. This is certainly not a complete list! Do you have other ideas for using our senses to experience Lent? If so, please share them in the comments! Such a great post, Sarah! You've given me some great ideas and, of course, I think I have to do them all! This would be great material to share with your pastor — maybe a link to the post in your church bulletin! Heidi Flanagan made this great activity – coloring for the littles, excellent reflection questions to help the older ones get deeper in the scriptures. This is wonderful! God bless your lent, sarah. I look fwd to more of your posts!